Parking for the U-M Comprehensive Cancer Center is in parking structure P1. If you have an appointment at a clinic located in the Taubman Center, please note that you will want to follow signs to the Taubman Center parking structure P1, further along East Medical Center Drive. 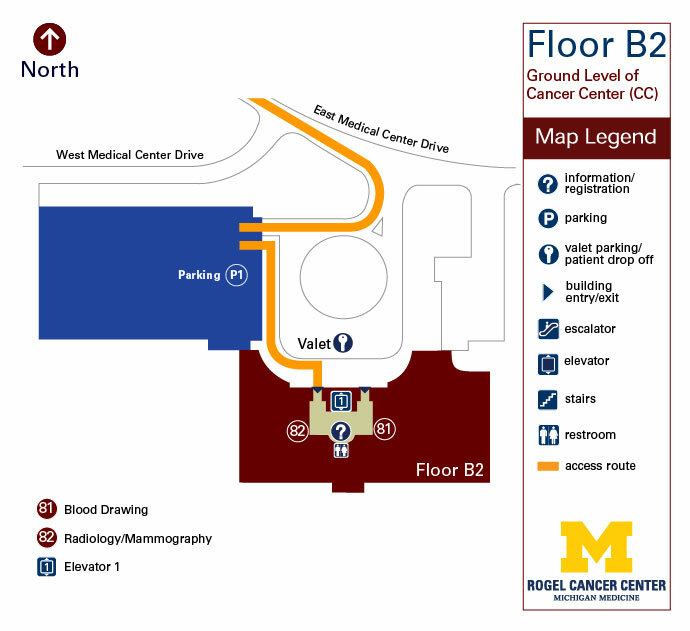 *Detailed directions to services located on Floor B2 of the U-M Comprehensive Cancer Center are listed below. Look for signage to assist you in finding your location. The Information/Reception desk will be directly in front of you as you enter the door. The elevators are across from the Information/Registration desk on Floor B2. Take the elevator to level 2 to access University Hospital and other medical center buildings. The Blood Draw station is located just to the left of the Information/Registration desk. The X-Ray / General Imaging station is located just to the right of the Information/Registration desk.